It’s hard to believe that e-commerce is only a couple of decades old. But it’s true. The first online sale was made in 1994—with the purchase of a Sting CD heralding the new era of secure online shopping. That’s according to YOMA in their compelling history of e-commerce infographic. Just a year later, Amazon and AuctionWeb (now eBay) were founded. PayPal made it easier for shoppers to make online payments to almost any merchant. Google gave consumers powerful tools to find what they wanted to buy and easily comparison shop while allowing businesses to carefully target consumers as never before. Magento provided a platform for managing e-commerce solutions across a range of industries, allowing retailers to easily set up their own e-commerce stores integrated with CMS. Facebook worked its own magic to put advertisers directly in contact with prospective customers and played a key role in the advent of today’s “social selling” trend. Gig economy work platforms gave businesses a way to hire product content writers to drive traffic to shopping sites. But the shift to an e-commerce-driven marketplace has not been without growing pains. Here are a few cautionary tales and takeaways that may save you from making serious mistakes. 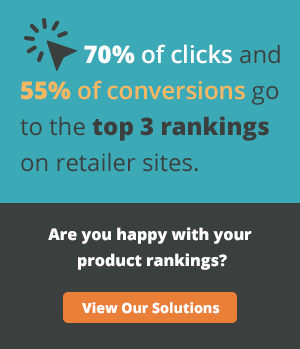 Bonus: See how Overstock.com optimized over 100,000 product descriptions in fewer than 60 days. Pets.com had a phenomenal IPO in 2000, raising $8.25 million. By the end of the year, the company was dead, despite its high-profile marketing efforts. Sadly, this retailer lost money on most of its sales, showing a lack of understanding about the relationship between revenue and profit. Takeaway: If you’re not making money selling online, you’re playing a losing game. Make sure your business fundamentals are sound no matter which marketplace you engage. "If you’re not making money selling online, you’re playing a losing game." In another dot-com bust, online retailer eToys experienced a nightmare before Christmas when they set up a website and started raking in orders. But the fact that they were selling inventory they didn’t have put them at the mercy of third-party suppliers who dropped the ball in a big way. Being unable to fulfill orders before December 25th was a disaster. When the company built and stocked its own warehouses the following year, the orders failed to materialize. If you try to visit the etoys.com website today, you are redirected to Toys”R”Us. Takeaway: Amazon has played the inventory management game much better by building a strong supply chain first. Take a note from their strategy and make fulfilling the customer’s needs your top priority—above just taking their money. "Make fulfilling the customer’s needs your top priority—above just taking their money." Ebay found out the hard way in 2014 that security is an easy concept to talk about and a difficult status to maintain. After their main database of customer info and user passwords was compromised, the company’s reputation took a big hit—especially since they base their reputation on bringing together trustworthy buyers and sellers. Takeaway: Whatever it takes to stay on top of security, do it. Ebay has recovered from the breach. Your company might not be able to take that kind of hit, and you don’t want to become a footnote in the history of e-commerce. This example comes from Asia, where online retail is a booming business. Baidu, the near-monopoly dominating the online search space in China, launched an e-commerce business that quickly failed in 2012 after surviving less than two years. The marketplace was simply too crowded. Takeaway: Having expertise and influence in one area doesn’t translate into being a force to reckon with in the e-commerce arena. Be prepared to do a lot of learning if you’re adding online sales to your business model. "Be prepared to do a lot of learning if you’re adding online sales to your business model." You can learn even more tips from our past and current clients. We’re always happy to share our expertise with you and your team. Contact us today to learn more.